This blog is now one year old! The first post was on an iconic stationery item: the Rhodia pad. A year later, we’re happy to welcome an accompanying Rhodia pencil. The pencil is painted in Rhodia’s famous orange. It’s very distinctive, with a triangular body, black dyed wood, black ferrule and black eraser. The imprinting is minimal: each side has Rhodia’s two fir tree logo and name. I’m not sure how well the photo reflects this, but the pencils were covered in graphite dust when they arrived. And not just a light dusting – enough that I’m not sure they can all be fully cleaned up. It seems very odd for a pencil at this price point. The Palomino is the only other pencil I’m aware of with this presentation issue. The pencil handles nicely, and the lead is rich and dark. I’m not a huge fan of erasers being on a pencil, but these seemed sleek, and are very effective at erasure. There is no country of origin stated, though I have a suspicion. Overall, they’re nice pencils, and ideal for jotting notes in your Rhodia pad. 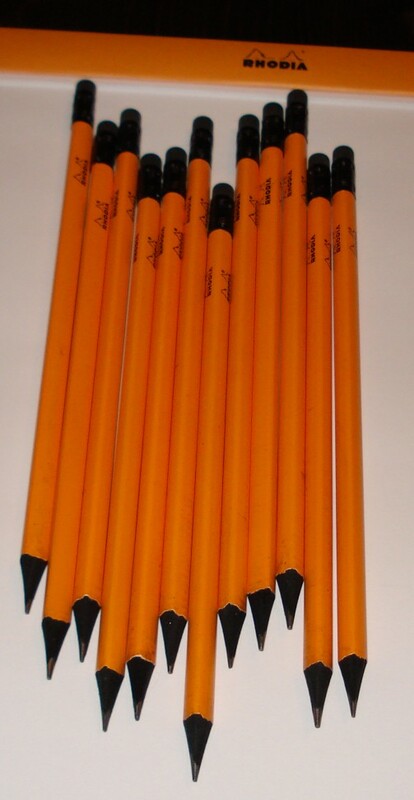 I’ve been trying to acquire these Rhodia pencils for over a year. Any tips on where to find them? Thanks for teh beautiful photo. Thanks for your comment. If you try a search engine, you’ll find they’re now at various Japanese retailers. (This seems to be a bit too long distance for some people’s tastes.) I’m not aware of any other source, though some smart North American and European retailers may (I hope) eventually pick them up. I just got a glimps of the new catalog of the main North American Distributor of Rhodia. They have a rhodia gift set that comes in a box shaped like a rhodia pad with some pads inside and a pencil. I called them, and the rep I spoke to said they are not importing the pencils alone. Rats! Adrai, Thanks for your comment. I’ve seen a photo here. It looks pretty sharp to me. I just bought three of them in Paris in a shop near Gare de Lyon ;-) ( about 1,3 € ~ 1,5$ each). I want to buy these pencils. What can I do?